When I read about the new DroboPro FS from Data Robotics, aimed at the small business market, I saw a new feature, Drobo Sync. It is coming as part of a new release of Drobo Dashboard in late October/Mid-November 2010 . I thought, wow, how timely, they read my post about why I don’t recommend a Drobo, and had this just waiting in the wings to tell me a big “told you so”. Sorry, but I think this feature, while nice, falls a little short. And, so far, Drobo Sync will only be available with the DroboPro FS. For other Drobos, there is still DroboCopy, which isn’t identical in functionality, but can setup scheduled backups to even non-Drobo based disk storage. Integrated offsite backup – The main new feature with the DroboPro FS is Drobo Sync which allows you to replicate your data from one DroboPro FS to another DroboPro FS on the network. 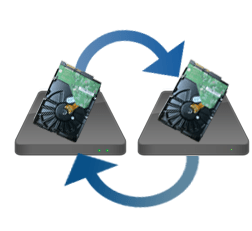 Drobo Sync is a data replication process and not a generational backup utility. The end result of using Drobo Sync will be to have the exact same set of files on the destination system as you have on the source system. If a file gets added or deleted from the source system that same file will be added or deleted on the destination DroboPro FS. While they do say that it is a “not generational backup”, they don’t come out and say that they recommend the use of another means of backup for really having a backup of your DroboPro FS. Even on Data Robotics’ “Best Practices” guide, they manage to not make mention of this for any of the Drobos.